The coach leans forward, her hands pressed on a table in a band room off the gymnasium, where a basketball game is about to start. She is silent for a minute or two. Her players shift uncomfortably. When Dorothy Gaters finally speaks, her message is familiar and firm and, as usual, about fundamentals: "Move your big feet." ''Box out." ''No fouls." "You're embarrassing yourselves!" she tells them even when they're winning handily. Gaters later explains: "Sloppy play is never enjoyable. Sometimes I'll be like, 'I hope this game is over soon. I can go home and watch some real basketball.'" For 40 years, Gaters has brought respect and pride to a West Side Chicago neighborhood that has seen more than its share of hard times. They understand this and also how much Gaters cares about them and their futures, whether they end up playing basketball after high school or not. 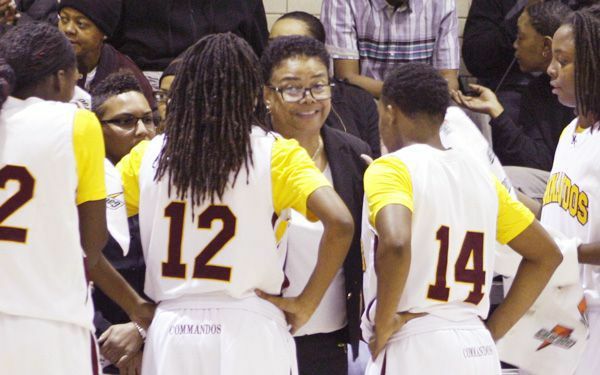 "Just do something, so that you can be self-supportive, help your family, and set an example for those who are going to follow you," the coach tells her players, who call her Ms. Gaters or often just "G."
This current crop of players helped Gaters reach her 1,000th career win in November, placing her among an elite group of coaches at any level of basketball. After the game, team members smiled and laughed as they watched her dance, with one arm raised, as she held her great-grandson and hugged and posed for photos with well-wishers, including about 30 former players who came to watch the historic win. "I'm so glad it's over," Gaters said later, acknowledging that she had lost some sleep the night before the game because she didn't know as much as she'd like about the opponent. Her Lady Commandos, as they are known, ended up winning 84-22. That worry, her attention to detail, her competitiveness, has led her teams to eight Illinois state titles and 23 city titles. A few of her players have gone on to play professionally, including Cappie Pondexter, a WNBA All Star and Olympic gold medalist. "She's the first coach who really taught me the game of basketball," says Pondexter, whom Gaters first saw play in a YMCA recreational league and then helped hone her raw talent. "I credit it all to her, my humble beginnings." Pondexter starred at Rutgers University, but she is far from the only one Gaters helped get to college, and that is among the coach's proudest accomplishments. "School before basketball," says Tineesha Coleman, a junior who hopes to play in college. She laughs, as does Pondexter when recalling the seemingly endless laps her team ran on the track above Marshall practice Gym 12, which has since been named for Gaters. "I wasn't a troubled kid. My problem was focusing on basketball so much," Pondexter says, remembering how Gaters would call her mother if Pondexter skipped class. In her case, the punishment would be to lose gym time. But though Gaters is tough, it is a tough love, her former players say. They recall a coach who occasionally took them to movies or out for burgers and fries. They note how Gaters has quietly provided a coat, clothing or shoes for a player who needs them. She and her staff recently helped find housing for the family of a player who was living in an apartment with no heat. "The relationship and the bond you have with her is forever," says Greyer, who now helps out with her own daughter's high school team. "It will carry you throughout the rest of your life." Gaters started coaching in 1975, and understands how one can learn and succeed, in big ways. The Mississippi native who grew up in Chicago says she took on the Marshall girls' team as a young teacher, fresh out of DePaul University, because "no one else wanted to do it." Gaters liked basketball, even played a bit herself. But she didn't know much about coaching, so she watched the boys' coaches carefully and took in any games she could find. Now, tucked amid the memorabilia in her office is a photo of Gaters shaking the hand of then President Bill Clinton at the White House, where she was honored for her work with young people in 1998. Another photo shows her being inducted into Women's Basketball Hall of Fame with Pat Summitt, the longtime women's basketball coach at Tennessee, at her side. In 2009, the Naismith Memorial Basketball Hall of Fame recognized Gaters with one of its lifetime achievement awards for high school coaches. The 68-year-old coach says she thinks about retiring, some day, and handing off her team to the former players who are her assistants. But some are doubtful she'll leave anytime soon. Assistant coach Gwen Howard, who played on some of Gaters' first teams, smiles and rolls her eyes playfully at the thought of the beloved coach retiring. "Please! I think this lady would do this forever if she could." This article is about Dorothy Gaters who is 68 years old and she coaches. 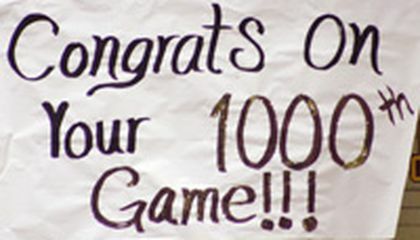 She has reached her 1,000th game and she had led her team to many wins and Championships. I love reading news stories like this! I think that coaches, teachers and people that students are around almost everyday have a much bigger impact on them than they realize. The more support a student has the more confident they are, at least that's what I believe. I think she is an amazing coach. She teaches her players to do good things in life even if they don't end up in professional basketball. She tells them to set goals for the people who will follow them and look up to them later on in life. This, in my opinion, is how a coach is supposed to be. Even if a coach motivated my team on the field and off the field no matter what school always comes first before playing sports having fun. The reason why i say that is because in school you get education and when you grow up you will be getting a job dealing with stuff that you had in school. Then after you get ur test done and your homework you can have fun and play sports. I think coaches play a huge roll in shaping a childs life and I believe they help build a kids character. Dorothy Gaters sound tough but in a good way and has seemed to do amazing things for these girls. Shes a motivator, supporter, and discipliner. She can teach some great life lessons just but coaching her team the right way. I think this is great that their coach encourages them to do good on and off the court. Most coaches are only concerned about the game but that is it. I applaud this woman for supporting her team in all that they do. I think that this is cool. She really cares about her team, and thats what I like in a coach. She seems hard but reasonable. My basketball coach is the same way. Thats why I love to play the game. The reason one of her players say school before basket ball is because she has to have her grade up before she can play anyways. So make sure you grades are up before you try to play!!! !